Along with holidays, cold temperatures, and snowy weather, winter also brings off-peak savings to destinations at home and abroad. From U.S. cities and national parks to European countries, just about anyone can find a winter destination that appeals to their interests and budget. The top five destinations for off-peak travel this winter are Austria; Chicago; Greece; Myrtle Beach; and Yellowstone National Park. Austria comes to life in winter. From its capital city, Vienna, to small towns in the Alps, wintertime events run nearly nonstop through January and February, and prices for airfare and accommodations drop as well, making the winter both fun and affordable. Vienna’s Ball Season begins in November and runs through March 10. Throughout the season, there are hundreds of balls, sometimes more than one a day. Highlights include the Vienna Opera Ball, the Hunter’s Ball, and the Rudolfina Redoute (Vienna’s only masked ball). The Imperial Ball is one of the most accessible to tourists. The cheapest prices start at €125 (about $160; check xe.com for current exchange rates) though student tickets cost €50 (about $64). Another Vienna attraction is Vienna Ice Dreams, a makeshift ice-skating rink in City Hall Square (the Rathaus) open from January 19 through March 4. Meanwhile, the city of Salzburg hosts the annual Mozart Week festival, a music-filled celebration of Mozart’s music from January 20 through February 5. South of Salzburg, in Filzmoos, the International Hot Air Balloon Week takes place from January 13 through 20 with 40 competing balloons from nations around the world. The Austrian Alps draw skiers, both recreational and competitive, from around the world each winter. In January, three major sporting events take place in the mountains around Austria. The Häknenkamm skiing race, a highlight of the Alpine World Cup, takes place in Kitzbühel. Kreischberg and Bad Gastein will host some events of the Snowboarding World Cup, and Kreischberg will also showcase some of the Ski Cross World Cup. Austria has the best off-season values in Western Europe according to a study by Cheap Tickets, with savings up to 53 percent. In my comparisons of winter and spring or summer vacation packages, I found top off-peak savings of nearly $900. Note that while Vienna and other cities in Austria will have low-season prices in winter, ski resorts and mountainous areas are popular wintertime destinations and won’t offer the same savings. Austria-info.com has helpful information on all aspects of planning a trip to Austria. Visiting Chicago in winter means experiencing the Midwest with wind, snow, and bitterly cold temperatures, but the city’s many indoor attractions and wintertime events make it worth braving the elements. Chicago’s Winter Delights Top 10 2007 is a two-month-long celebration featuring 100 events in 10 categories including culinary arts, dance, history, international culture, fashion, music, and theater. Winter Delights guidebooks are available at the visitor’s centers at the Chicago Cultural Center (77 E. Randolph St.) and WaterWorks (163 E. Pearson St.). The McCormick Tribune Plaza in Millennium Park is transformed into a free outdoor ice-skating rink in mid-November, drawing about 100,000 skaters through its closing on March 16. Skate rentals cost $7. Navy Pier hosts the family-friendly WinterWonderfest December 8 through January 7, complete with Santa’s Village, an indoor ice-skating rink, climbing walls, cookie decorating, an indoor Ferris wheel, and more attractions. In December, two holiday-themed shows include the Joffrey Ballet of Chicago’s production of The Nutcracker through December 27 and the Welcome Yule! concerts put on by the Chicago Symphony Orchestra, Chicago Symphony Chorus, and Welcome Yule! Children’s Ensemble. Broadway in Chicago has three popular shows playing in Chicago this winter. Wicked has an open run in Chicago, while Doubt, the 2005 Tony Award winner, runs from January 9 through 28. The national tour of Twelve Angry Men runs from January 30 through February 11. New exhibits are visiting two of Chicago’s popular museums this winter. The popular Body Worlds exhibit is returning to the Museum of Science and Industry from January 17 through April 29 with Body Worlds 2: The Anatomical Exhibition of Real Human Bodies, which includes 20 full-body plastinates and 200 preserved human species. The Art Institute of Chicago is exhibiting Cezanne to Picasso: Ambroise Vollard, Patron of the Avant-Garde, featuring pieces by Cezanne and Picasso, as well as Gauguin, Renoir, and Van Gogh, from February 17 through May 13. Light Nights on Magnificent Mile adds festivity to Michigan Avenue with illuminated sculptures and Saturday-evening fireworks displays. Additionally, downtown Marriott hotels have Light Nights packages, with discounted room rates and shopping and dining gift certificates, from January 14 through March 4. JetBlue begins service at Chicago’s O’Hare airport on January 4, which could cause fares to drop as major carriers compete with JetBlue’s introductory prices. I searched for Chicago hotels to see how much you can save by traveling in winter and found savings of up to $210 per night. Prices are based on double occupancy and were researched on Travelocity. For more information about Chicago, visit 877 Chicago’s website. By visiting Greece in winter, travelers can save big on airfare and accommodations, and also experience the country as the locals do. Visitation drops off in fall, and by winter, there are very few tourists, leaving hotels and archaeological sites such as the Acropolis nearly empty. Greece’s Mediterranean climate remains sunny and pleasant, with temperatures in the 50s in Athens and the islands, although it will be colder and even snowy in the mountains. Contrary to popular belief, the islands don’t shut down completely, though fewer hotels will be open. Christmas is celebrated for 12 days in Greece, ending January 6 with Epiphany celebrations. The main festivites take place in Piraeus, though islands and towns near water put on events as well. Carnival, known as Apokreas in Greek, is observed in Greece as much as in New Orleans or the Caribbean. For nearly a month in January and February, Greeks celebrate nightly with eating, drinking, and dancing. Events heighten on the weekends, with outdoor music, dance performances, and float parades. This year, Carnival runs from January 28 through February 19, though the major weekend is February 16 to 18. Celebrations occur all around Greece, particularly in Athens, Patras, Tyrnavo, and the islands Skyros and Thassos. Skiing has become popular in Greece, although it is mostly overlooked by foreign visitors. Greece has 19 ski resorts in destinations including Kalavrita, Pelion, Delphi, the Peloponessos, Macedonia, and Epirus. Downhill and cross-country skiing and snowboarding are all available. Cheap Tickets‘ survey found that Greece offers some of the best savings in Europe during winter, with travelers finding vacation-package bargains of up to 29 percent. I compared peak and off-peak airfares and found savings of up to $539. Off-peak fares are based on travel from February 8 to 15, 2007, and peak fares are based on travel from June 13 to 20, 2007. Prices were found on Travelocity and include taxes and fees. For more information about visiting Greece in winter, visit the Greek National Tourism Organisation’s website. GreekTravel.com is also a helpful resource for first-person advice. Myrtle Beach is an ideal spot for a mellow winter getaway. This South Carolina beach community quiets down in the winter months, yet the weather is mild enough for outdoor activities like golf on the area’s many famous courses. Plus, hotels drop their rates to draw off-peak visitors. Myrtle Beach has activities and attractions that remain open all year. The Grand Strand beach has two major hubs of activity: Broadway at the beach and Barefoot Landing. Both have hundreds of shops and restaurants, as well as other attractions. Broadway at the beach has a movie theater and IMAX theater, as well as Ripley’s Aquarium, which will be decked out with Christmas trees representing the 50 states, and NASCAR SpeedPark. Meanwhile, Barefoot Landing is home to Alligator Adventure, Ghosts and Legends; and the Alabama Theatre. Brookgreen Gardens is also a popular attraction, with its flower, plant, and sculpture gardens and small zoo. Golf is one of Myrtle Beach’s biggest draws, and courses and resorts offer discounted golfing packages. Myrtle Beach Trips has multi-play packages, and the Breakers Resort’s “Mid Week Supersaver” package includes 20 percent off four nights’ accommodations and four days of golf. Lodging is also discounted in winter. Camping and cabins in Myrtle Beach State Park are 25 percent off from December, 2006, through February, 2007. Through January, Sands Resorts have discounted rates, and Barefoot Resorts are offering free nights through March 31. Holiday discounts on entertainment, accommodations, and shopping are being offered through December 31. I compared winter and summer accommodations rates at Myrtle Beach resorts, and found savings of up to $135. Prices are based on double occupancy and were researched on Expedia. The Myrtle Beach Area Convention and Visitors Bureau’s website has information on all aspects of planning a trip to Myrtle Beach. Yellowstone was the first national park in the U.S. and remains one of the most popular. It receives more than three million visitors per year, but only 140,000 of those come during the winter. Along with being less crowded, rates for accommodations drop for the season, making it an affordable time to visit. However, though the park spans parts of Idaho, Montana, and Wyoming, only the north entrance in Gardiner, Montana, is open in winter. Wildlife viewing is particulary good in winter. 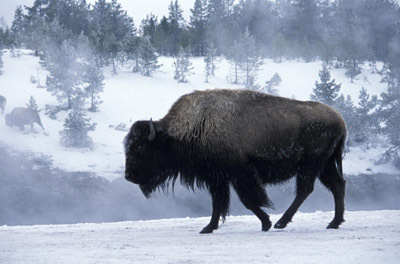 Visitors can easily spot gray wolves, bighorn sheep, pronghorn antelopes, moose, and bald eagles, among other animals. Other wintertime activities include alpine and cross-country skiing, snowshoeing, snowmobiling, ice skating, and touring the park by snowcoach. Equipment can be rented in the park or from providers and hotels outside the park. Winter temperatures are very cold, from zero to 20 degrees in daytime to sub-zero temperatures at night, with an average snowfall of 150 inches per year. However, warming huts are located around the park, some of which have snacks and hot beverages. Xanterra Parks and Resorts operates the in-park hotels, and two of its properties, the Old Faithful Snow Lodge and Cabins and the Mammoth Hot Springs Hotel, are offering winter specials starting at $99 per person. Packages include two nights’ accommodations, daily breakfast, a 10 percent gift-shop discount card, welcome gifts, equipment rentals, and additional meals. Hotels outside of Yellowstone are also offering winter packages that feature discount accommodations and winter activities, including the Gray Wolf Inn and Three Bear Lodge. You can save as much as $50 per night by visiting Yellowstone during winter instead of the peak summer season. Prices are based on double occupancy and were found on each provider’s website. The National Park Service’s Yellowstone site has a wealth of information about visiting the park. The Total Yellowstone Page website is also a helpful resource with a massive amount of information.